With all his snuffling and grunting this man is really growing on me but he does keep telling porky pies. Microwaved bacon sandwich?!? he does have the grace to say it “should come out nice and crispy”, but I can tell you now it doesn’t. I happen to know this because my mum, a reluctant cook at the best of times, has done it thus for decades and I still can’t bear the floppy dishrags produced that way. 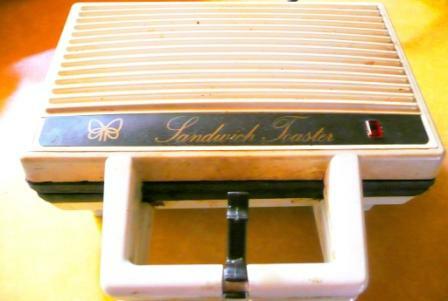 Mind you, she does buy wet cure bacon then goes on to make her sandwiches in not a panini toaster, nor a George Forman grill, but the original, ’70s modern miracle sandwich toaster – its non-stick surfaces coated with three decades’ worth of rancified margarine, also apparent on its not-very-cleanable exterior – which doesn’t exactly add to the appeal. The Telegraph tells us that MPW is business-linked with microwave marketing but fails to elaborate: perhaps his range has a miracle control whereby the bacon emerges perfectly. The only oven I could find with his name on it was this one, and with all those bells and whistles (what the hell is digital jog control?) perhaps it produces the best bacon in the world, but I rather doubt it: doesn’t look much easier to keep clean than my mum’s contraption either. No matter to all that; Marco’s heart is bang in the right place when it comes to food. He likes it real, apparently. Rather more real than I do, as I can’t imagine plucking a pigeon but on the other hand I do have it in mind to purchase a slice of porchetta made from a piggy so obviously loved. Next time I’m in Vieux Nice that’s just what I’ll do! 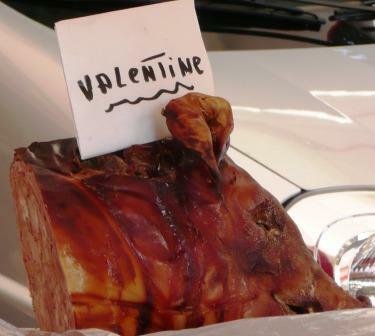 More porchetta pics Chez Pim but none as happy as Valentine here. Increase the cooking time until it is crispie. Honestly it does work.